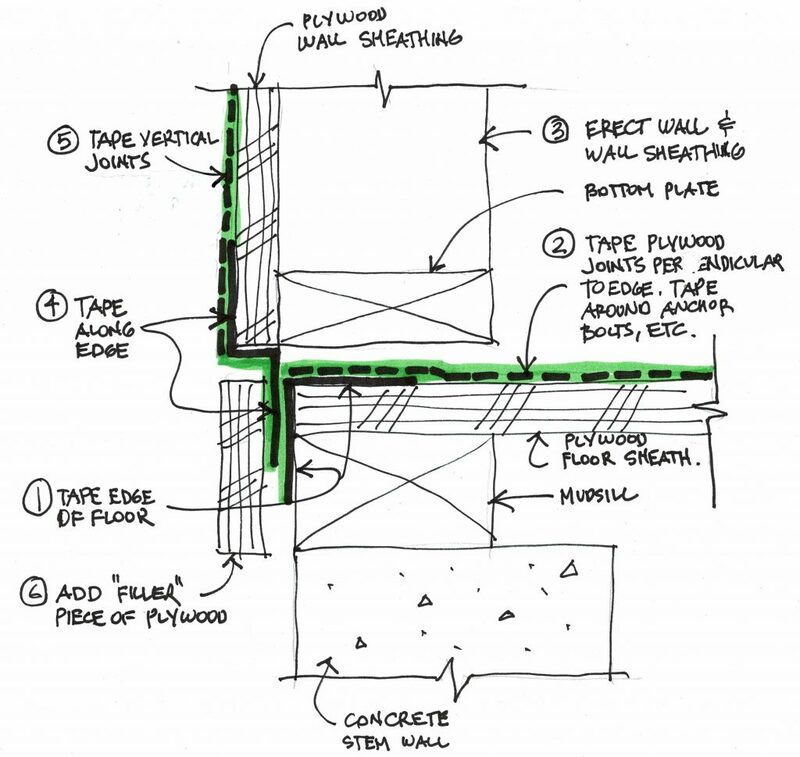 In initial discussions with our green building consultant, Katy Hollbacher of Beyond Efficiency, she emphasized how the plywood skin of a building, with the joints sealed with tape, could be a very effective and cost-efficient air barrier. 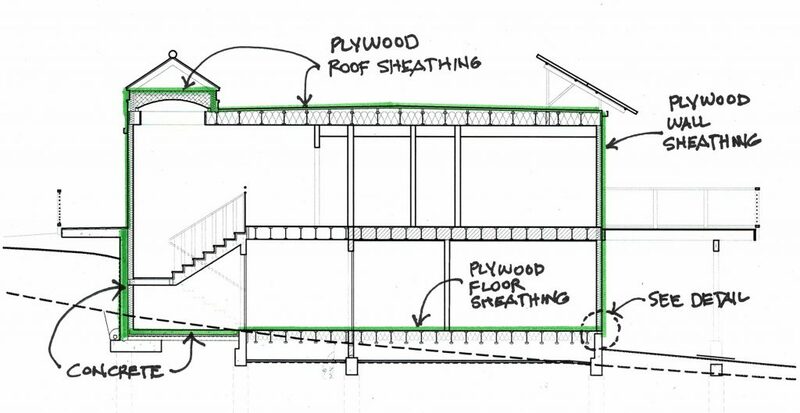 Most buildings in the Bay Area are completely sheathed with plywood (floor, walls and roof) for structural reasons, so that part of the air sealing envelope is essentially free. One of the challenges of this approach is that projecting structure (at eaves, for instance) is hard to seal. So we eliminated eaves from our design, the resulting ‘boxy’ form being congruent with our Mediterranean design esthetic in any case. The one exception, an overhang at the front door, will be dealt with by our air sealing consultant, Terry Nordbye of Air Sealing Solutions. He has a special liquid sealing product, environmentally benign and applied with a spray gun, that can quickly cover complicated joints that would be tedious to do with tape. The sealing tape we chose, SIGA Wigluv 60, is one of the standards in the green building industry (available online at Small Planet Supply). The 60 refers to its 60 millimeter (2-1/4”) width. It’s an extremely sticky, flexible, durable tape. Easy enough to install – just peal off the backing, apply, and pressure it down with a rubber roller. It can be torn by hand if you’re in too much of a hurry to neatly cut it and is flexible enough to wrap around ducts and pipes where they penetrate the plywood skin. Terry Nordbye feels it’s better for most sealing purposes than the foam sealants used otherwise. Every plywood joint in our exterior envelope got sealed with this stuff. 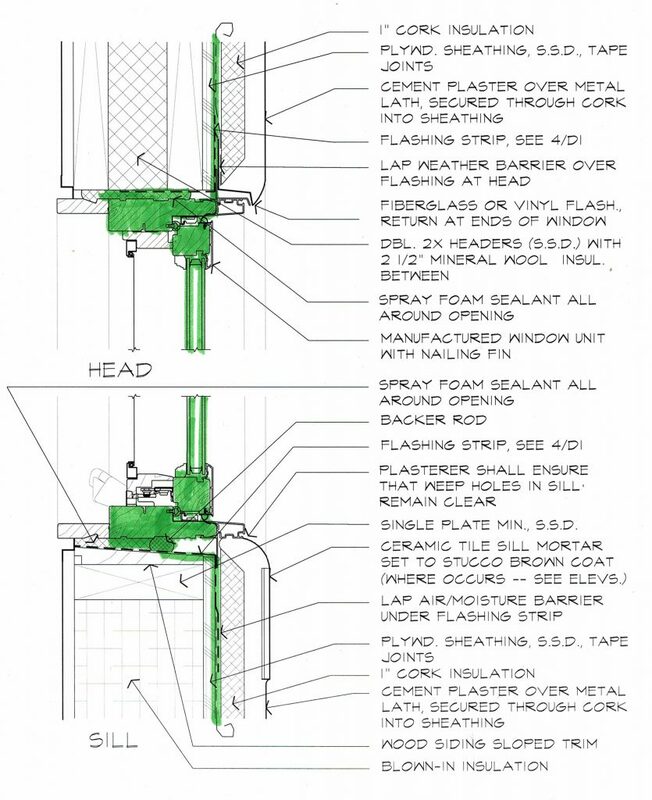 You might notice that the rafter space is inside the air sealed envelope and therefore not ventilated, which is normally required by the building code. However, there is an exception if insulation is added on top of the sheathing – this keeps the rafter spaces warm enough that moisture won’t condense on the surfaces on cold winter nights. Our roof has an inch of cork insulation on top of the sheathing. The roofing itself is ventilated so that any moisture trapped under it has a chance to evaporate out. Our window and exterior door details incorporated similar tape-style flashing and perimeter sealing with DAP low expansive latex-based sealant. The windows and doors themselves are rated for low air permeability. Finally, a very small amount of foam plastic sealant was used in a few places. So that’s the whole package. 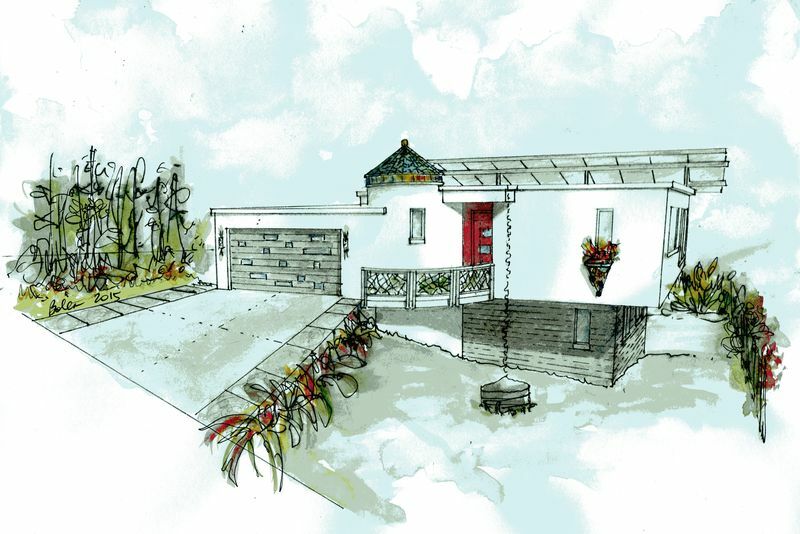 The house is undoubtedly not quite submarine-tight but Terry Nordbye has expressed confidence in the design and execution. He’s performing blower door tests and troubleshooting tomorrow to see just how well sealed we are – stay tuned for test results! If we do well, we’ll have to celebrate with some fine French wine and perhaps some… Swiss cheese!